“The greenest building is the one that’s already built.” Spoken by architect Carl Elefante, it encompasses one of the major tenets of historic preservation. We often think of sustainability as something achievable only in new construction, where LEED certifications and modern technology can help reduce a building's carbon footprint, but sustainability and historic position don’t have to live in separate worlds. However, new buildings need new materials. And that means producing them uses a lot of resources, money, and energy, not to mention that many new materials have shorter lifespans than older ones (just look at the difference between old growth and new growth wood). So when you have the opportunity to reuse a building that’s already built, it seems like a no-brainer. There are ways to green your historic house today (while preserving its historic fabric) so that it reduces energy consumption and lowers your energy bills. We take a look at a few here. Before you start making changes to your historic house to make it more energy-friendly, you first have to understand what parts of your house need help. The best way to do this is to conduct an energy audit. One of the most popular examples is the blower door test. This test involves using a high-powered fan to take the air out of the building, which depressurizes the interior. The difference in air pressure is then measured with an air pressure gauge. As the Preservation Society of Charleston explains, “The difference in pressure causes the outside air to seek its way into the building through any cracks, drafts or unsealed openings.” That shows you where you need to seal up windows, doors, and other drafty places. One of the biggest misconceptions is that old houses are drafty because of their historic windows and that the only solution is to replace them. As the National Trust’s Research & Policy Lab (formerly known as the Preservation Green Lab) notes in their study Saving Windows, Saving Money, historic windows rarely deserve to be completely replaced. Instead, weatherstrip them or install minimally invasive storm windows so that they keep the drafts out and lower your energy bills. The study found that retrofitting windows are the most cost-efficient way to decrease a historic house’s carbon footprint. As a bonus, old growth wood found in historic windows lasts longer than modern day wood, so preserving your historic windows will keep you from having to replace them more often. Energy escapes through places that are usually uninsulated, especially basements, crawl spaces, and attics. Consider insulating these spaces to prevent air from escaping. Cellulose is a great option because, unlike spray foam, it’s reversible. Just note: You should refrain from insulating walls because you’re removing the permeable vapor barrier inherent in historic structures. The walls of historic houses are made to breathe, but inhibiting movement of air and heat through and around the wall can lead to issues like trapped moisture. 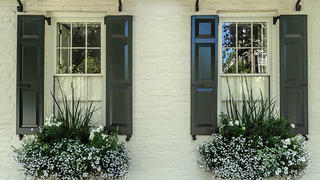 If you’re able to, consider installing solar, wind, or geothermal renewable energy sources on your historic property. 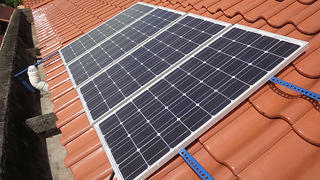 Solar panels, for example, if installed properly, produce electricity naturally and will help lower your bills. When connected to a utility power grid, modern wind turbines can also help create electricity using renewable resources and in a more cost-efficient manner. Read more about installing solar panels on historic properties here. According to the General Services Administration, High Efficiency Incandescent (HEI) lamps reduce energy by 50 to 75% and use only 25% of the energy that regular incandescent bulbs use. They also don't alter the appearance of historic light fixtures where the bulbs are visible, like LEDs do. 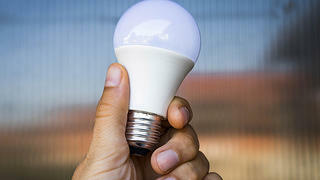 Otherwise, LEDs are a good option when the bulb is obscured by opaque shades or lenses.